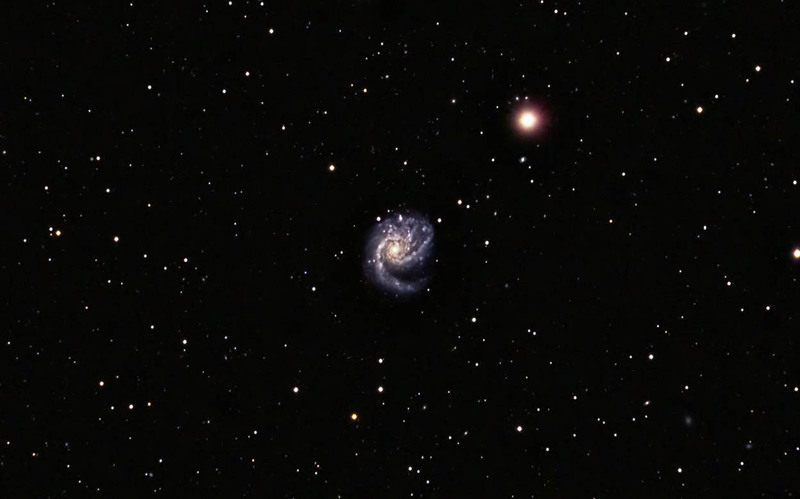 M 99 is a lovely spiral galaxy located in the constellation of Coma Berenices. It is part of the Virgo Cluster of galaxies and was discovered by Pierre Mechain in 1781. He reported his discovery to Charles Messier, who included it in his catalogue later that same year. The galaxy has an extended arm that is likely the result of a past encounter with a neighboring galaxy. It is the second celestial object to have its spiral structure observed by Lord Rosse in 1846. M 51 (the Whirlpool Galaxy) was the first. Processing: Images were focused using a Bahtinov mask and the camera's live view. The subframes were aligned and combined in ImagesPlus. The composite image was adjusted in Photoshop. Topaz Detail and DeNoise were applied. The image was cropped by approximately 50%. Note: Taken from my backyard observatory in southeastern Minnesota on 4/2-3/16.